62.8. 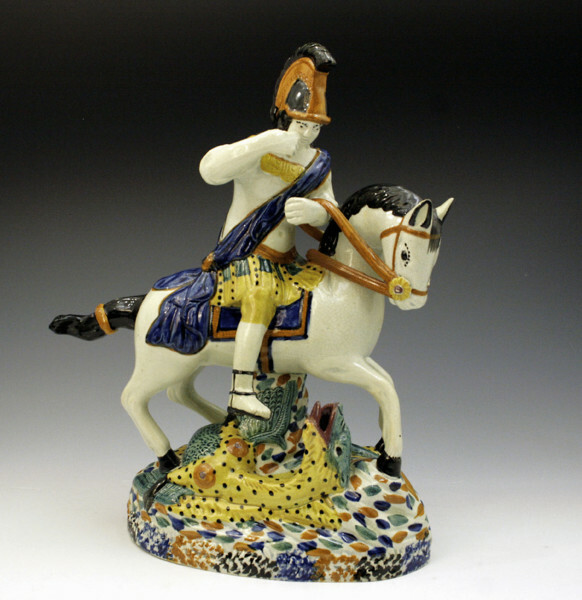 Image courtesy of Leonard Russell in Lewis, "A Collector's History of English Pottery." 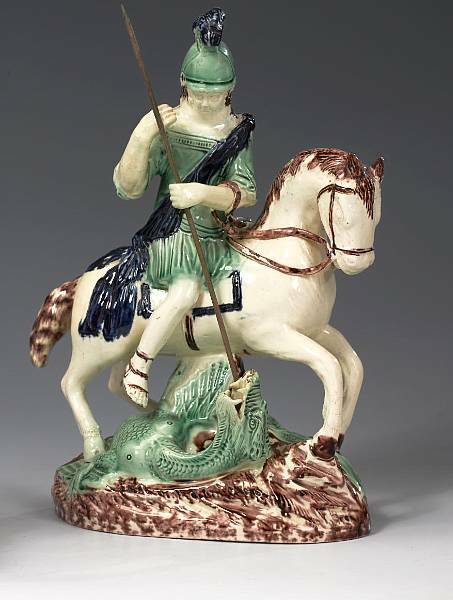 The earliest earthenware figures of St. George and the dragon were made by Ralph Wood and are sometimes impressed “23”. 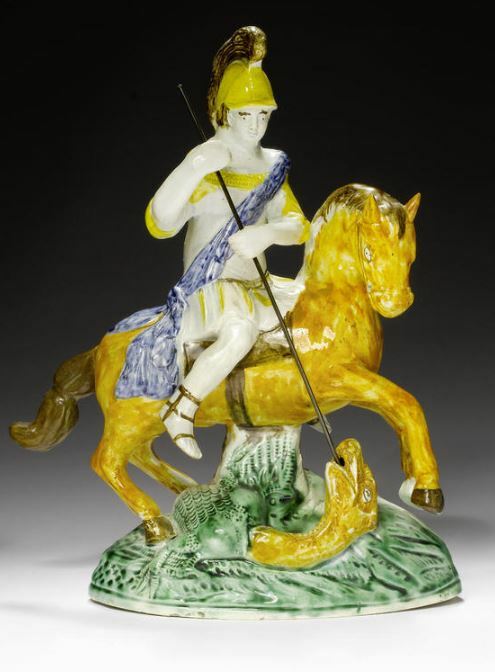 The sequence of impressed numbers on Ralph Wood figures is thought to correspond to the chronological introduction of new models,and the number “23” in the 170-number range is consistent with this model having been made early in the Ralph Wood era (1782–1795). 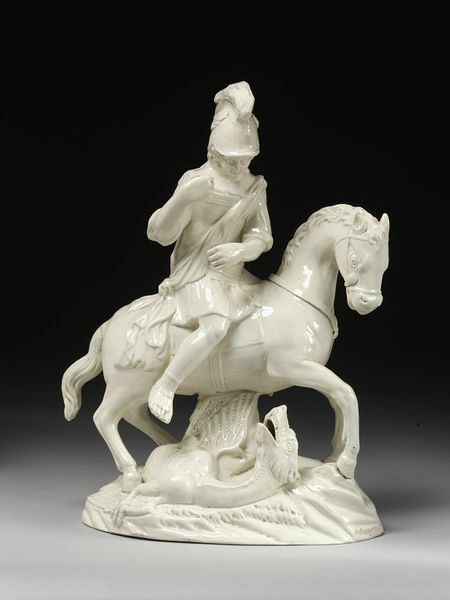 An order in the Wedgwood archive dated November 16, 1783, states, “Bought of Ralph Wood…12 George & Dragons 2/- a pair”. 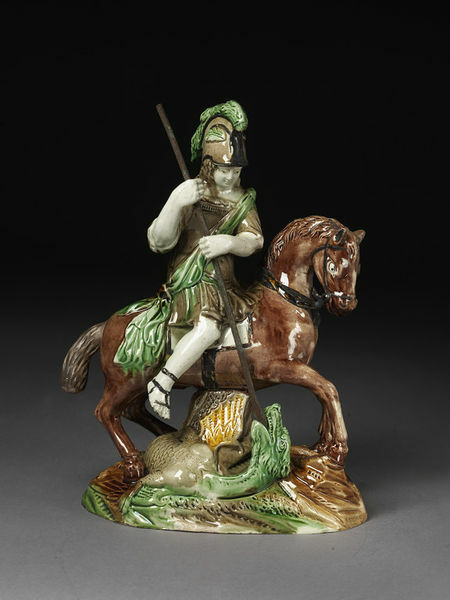 Ralph Wood figures of Saint George impressed “23” are recorded decorated in colored glazes (Weldon Collection) and decorated in enamels (Falkner). Examples impressed both “Ra. 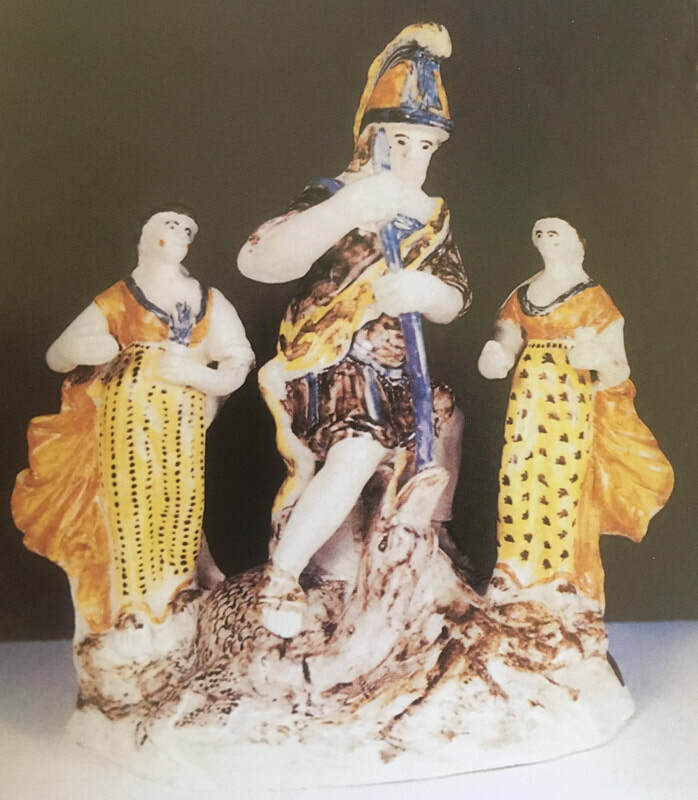 Wood Burslem” and “23” are documented (in colored glazes: Sotheby's London in Halfpenny p84; unpainted creamware: Victoria and Albert Museum 723-1931) Similar unmarked figures are in the Fitzwilliam Museum (C.40-1930), the National Gallery of Victoria (4530-D3), and the Winterthur Museum (2002.0030.006). Impressed "Ra. Wood Burslem" and "23". (c) Victoria and Albert Museum, London. Attributed to Ralph Wood. (c) Victoria and Albert Museum, London. The following figures, rather like the Ralph Wood model, differ in various ways in the modeling. ​Hover your mouse over small images to read their captions. Click images to enlarge. Probably made in Yorkshire. 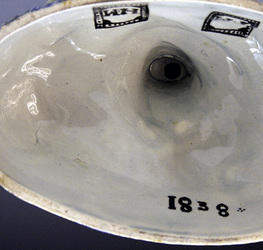 Marked beneath with the initials HM and TM and the date 1838 painted beneath the glaze. Courtesy John Howard. Previous figure, marked with the initials HM and TM and the date 1838 painted beneath the glaze. Courtesy John Howard. 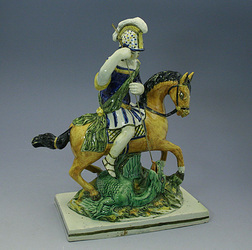 This perhaps unique group shows St George, flanked by two classical maidens, slaying the dragon. 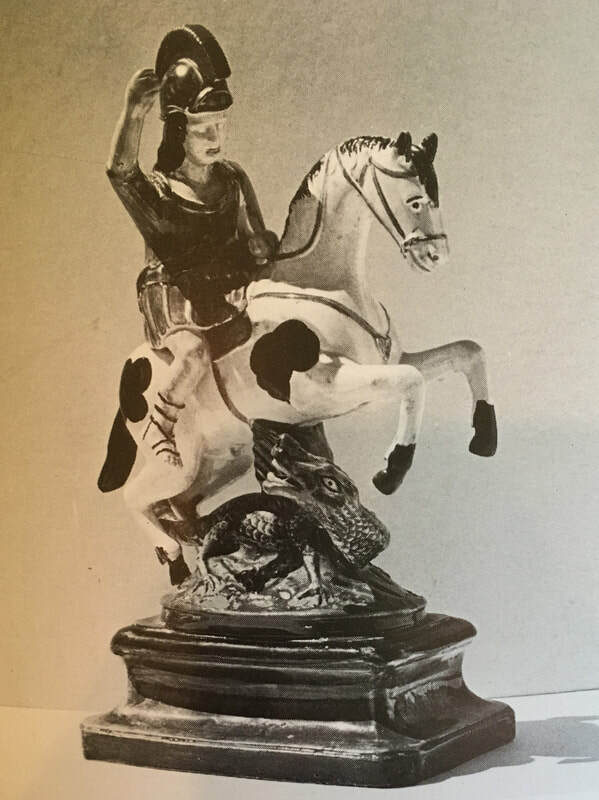 The photo is taken from Lewis's "Pratt Ware," second edition.